Ook de eindresultaten van de ENGOT-OV16/NOVA studie, niraparib bij gevorderde eierstokkanker bevestigt de goede resultaten uit de eerste analyse, zie hieronder artikel van 6 november 2016. Resultaten tonen aan dat een behandeling met niraparib ziekte progressie en de sterfte met 73% vermindert bij eierstokkankerpatiënten met de BRCA mutaties BRCA 1 en 2 (HR = 0.27) en met 55% bij eierstokkankerpatiënten zonder BRCA 1 en 2 mutaties. (HR = 0.45). Among patients who were germline BRCA mutation carriers, the median chemotherapy-free interval for those treated with niraparib was 22.8 months, compared to 9.4 months for control. Among patients without germline BRCA mutations, the median chemotherapy-free interval for patients treated with niraparib was 12.7 months, compared to 8.6 months for control. Among patients who were germline BRCA mutation carriers, the median time to first subsequent treatment for patients treated with niraparib was 21.0 months, compared to 8.4 months for control. Among non–germline BRCA mutation carrier patients, the median time to first subsequent treatment for patients treated with niraparib was 11.8 months, compared to 7.2 months for control. Progression-free survival 2 data were statistically significant and favored niraparib over control for patients in both cohorts. De PARP remmer niraparib verlengt de tweede progressievrije periode met 15,5 maand (21 maanden versus 5,5 maanden) in vergelijking met een placebo. Nirapanib werd toegevoegd aan de chemo na een recidief van eierstokkanker die gevoelig bleek voor op platinum gebaseerde chemo en welke een BRCA 1 of 2 mutatie bij zich droegen. Maar ook bij geen BRCA mutaties maar wel andere DNA mutaties werkte niraparib ook nog beduidend beter dan een placebo: progressievrije tijd steeg met ca. 8 maanden (12.9 vs 3.8). Dit blijkt uit de resultaten uit de ENGOT-OV16/NOVA studie gepresenteerd door hoofdonderzoeker Mansoor Raza Mirza, MD op ESMO 2016 European Society for Medical Oncology in Copenhagen (Abstract LBA3_PR), en tegeljkertijd gepubliceerd in The New England Journal of Medicine. Vergeleken met andere PARP remmers zoals olaparib zijn deze resultaten nog beter dan bij olaparib, aldus de onderzoekers. En heel veel beter in vergelijking met avastin - bevacizumab. 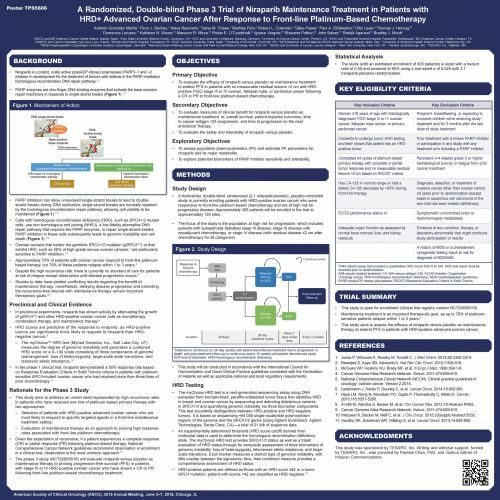 “The current options for maintenance therapy in the European Union (EU) are bevacizumab —which can only be given once and improves progression-free survival by just a few months—and the PARP inhibitor olaparib , which is only approved in patients with a germline BRCA mutation (about 10%–15% of ovarian cancer patients). No maintenance therapy is approved outside the EU,” said lead author Mansoor Raza Mirza, MD, Chief Oncologist at Rigshospitalet, Copenhagen University Hospital and Medical Director of the Nordic Society of Gynaecological Oncology. 12.9 vs 3.8 months in a subgroup of the nonmutation cohort who had homologous recombination DNA repair deficiencies. Compared to placebo, niraparib significantly prolonged the second progression-free survival, time to first subsequent treatment, and chemotherapy-free interval in the mutation and mutation-free groups, as well as in the HRD subgroup. More than 10% of patients had grade 3/4 adverse events following treatment with niraparib, of whom 28% had thrombocytopenia, 25% had anemia, and 11% had neutropenia. These were resolved with dose adjustments. Vergeleken met een placebo, verlengt niraparib statistisch significant zowel de tweede ziekte progressievrije overleving en de tijd tot een volgende behandeling nodig is en verlengt de chemo vrije tijd in zowel de groep patiënten met een BRCA mutatie als zonder BRCA mutatie als ook voor andere DNA mutaties. Het volledige studierapport: Niraparib Maintenance Therapy in Platinum-Sensitive, Recurrent Ovarian Cancer ia gratis n te zien. 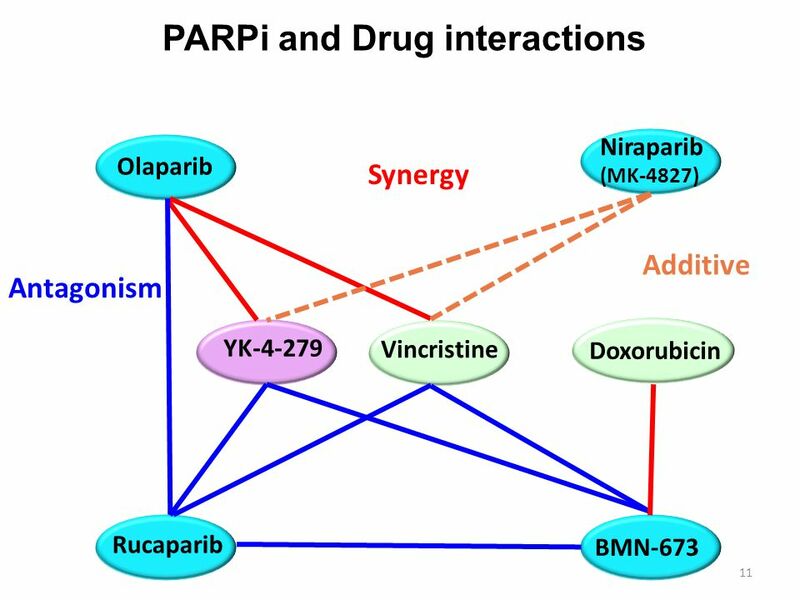 Niraparib is an oral poly(adenosine diphosphate –ribose) polymerase (PARP) 1/2 inhibitor that has shown clinical activity in patients with ovarian cancer. We sought to evaluate the efficacy of niraparib versus placebo as maintenance treatment for patients with platinum-sensitive, recurrent ovarian cancer. In this randomized, double-blind, phase 3 trial, patients were categorized according to the presence or absence of a germline BRCA mutation (gBRCA cohort and non-gBRCA cohort) and the type of non-gBRCA mutation and were randomly assigned in a 2:1 ratio to receive niraparib (300 mg) or placebo once daily. The primary end point was progression-free survival. 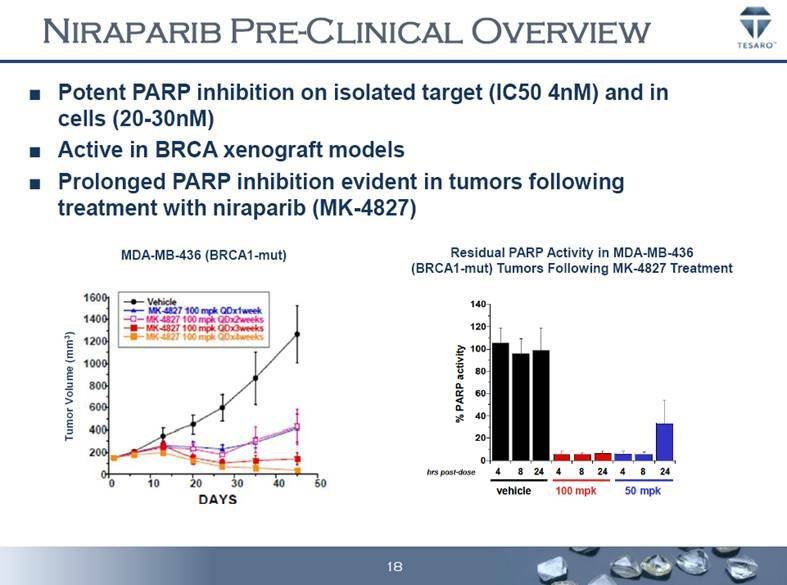 Of 553 enrolled patients, 203 were in the gBRCA cohort (with 138 assigned to niraparib and 65 to placebo), and 350 patients were in the non-gBRCA cohort (with 234 assigned to niraparib and 116 to placebo). Patients in the niraparib group had a significantly longer median duration of progression-free survival than did those in the placebo group, including 21.0 vs. 5.5 months in the gBRCA cohort (hazard ratio, 0.27; 95% confidence interval , 0.17 to 0.41), as compared with 12.9 months vs. 3.8 months in the non-gBRCA cohort for patients who had tumors with homologous recombination deficiency (HRD) (hazard ratio, 0.38; 95% CI, 0.24 to 0.59) and 9.3 months vs. 3.9 months in the overall non-gBRCA cohort (hazard ratio, 0.45; 95% CI, 0.34 to 0.61; P<0.001 for all three comparisons). The most common grade 3 or 4 adverse events that were reported in the niraparib group were thrombocytopenia (in 33.8%), anemia (in 25.3%), and neutropenia (in 19.6%), which were managed with dose modifications. SEER Cancer Statistics Review (CSR) 1975–2013. Bethesda, MD: National Cancer Institute, 2016 (http://seer.cancer.gov/csr/1975_2013/). GLOBOCAN 2012 v1.0, estimated cancer incidence, mortality and prevalence worldwide: IARC CancerBase no. 11. Lyon, France: International Agency for Research on Cancer, 2013 (http://publications.iarc.fr/Databases/Iarc-Cancerbases/Globocan-2012-Estimated-Cancer-Incidence-Mortality-And-Prevalence-Worldwide-In-2012-V1-0-2012). Reageer op "Niraparib geeft zeer goede resultaten bij recidief van gevorderde eierstokkanker die eerder gevoelig bleek voor op platinum gebaseerde chemo copy 1"